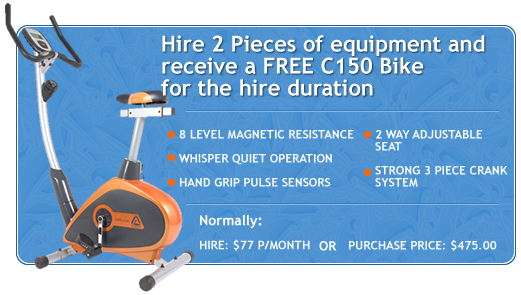 We have a fantastic deal running at the moment for those looking to hire fitness equipment. Already planning on hiring a treadmill and elliptical machine? Why not add a bike? And if you were thinking of hiring a bike and another piece of fitness equipment, it’s a terrific opportunity to try something new, for no extra charge. To take advantage of this fantastic offer, either give us a call on 03 6234 1244 or come and visit us in-store (we’re on the corner of Collins and Argyle Streets).